Justin Tucker, Chair of the Chicago Libertarian Party, is running for Illinois State Representatives in District Four. 71R: With thousands of career options, what inspired you to seek a career in politics? Tucker: I have been interested in politics since I was a teenager. I have been a libertarian since I learned about Harry Browne, the Libertarian Party nominee in 2000. It was only in 2015 that I jumped into activism and joined my local LP chapter. What inspired me to join was the gross misconduct of the Chicago Police Department and the Chicago amusement tax imposed applying to Netflix. I felt enough was enough. I could no longer be willfully apathetic or believe I couldn’t make a difference. I am currently the Chair of the Libertarian Party of Chicago, serving since 2016. I also worked on the Gary Johnson’s 2016 campaign as Volunteer Coordinator in Illinois. This year, I collected over 1600 signatures for our statewide candidates to be on the ballot this November. I choose to run for Illinois House of Representatives in District 4 with the purpose of telling my neighbors about our candidates and maybe getting a few signatures for myself. My energy, however, was better spent circulating petitions for the statewide slate than circulating my own. Also, as a Libertarian, I didn’t want to deal with all the government paperwork to get on the ballot. I will instead be running a write-in campaign to have a platform to talk about why our candidates are the best choices for Illinois and to share our ideas with the electorate. 71R: Many people when they think of government they think of Congress or the presidency. Why is politics at the state level, and in the state House of Representatives, so important and motivated you to get involved? Tucker: It is often said that all politics is local. Politics at the state and local level are so important because they are closest to the people, and thus easier to make an impact on policy. That’s why I chose to involve myself in a run for a State House seat and also why I support statehood for Cook County. I’m a fan of local control. It’s easier to hold the crooks accountable when they’re in your neighborhood as opposed to far away legislature. 71R: For over 150 years the United States has been locked in the two-party duopoly. What attracted you to the Libertarian Party? Tucker: I was attracted to the Libertarian Party because it’s the only party that is for small government and means actually means it. One of the biggest issues for me is getting the government out of the way of my LGBT friends. Republicans claimed to be for smaller government but fought against the right of gender and sexual minorities to marry. When I discovered the Libertarian Party, I saw they were consistently for small government across all areas of life. I’ve been a fan ever since. My only regret is that I didn’t get involved with activism sooner. 71R: Illinois is often brought to the political forefront and were put into the national spotlight during the gun control debates, a debate that still exists today, due to Chicago’s crime. Where do you stand on this critical issue? Tucker: As a Libertarian, I believe in the right to protect yourself. Chicago residents like Otis McDonald stood up to the city’s infringement on the right to self-defense and ended up changing the course of history. The fight, however, is not over. In Illinois, we need to abolish the Firearm Owner’s Identification card, conceal carry licensing and waiting periods. The Second Amendment is the only permit anyone needs. Drastically reducing gang violence in Chicago is more of a complicated task. We can start by ending drug prohibition, cutting taxes and regulations to attract economic development, and reforming education. 71R: Our Founding Fathers even disagreed on how to interpret the Constitution, shown in the Federalist vs. Anti-Federalist debates. What is your interpretation of the Constitution, and how does that influence your view on government? Tucker: The Constitution has, without a doubt, contributed to the development of liberal thought. It was a document designed to limit the power of the federal government and protect the rights of the people. I have a tremendous amount of respect for it. The problem, however, is that it hasn’t prevented the federal government from overstepping its authority. If our federal government followed the Constitution literally as it is currently written, the size and scope of government would be drastically reduced. I certainly wish that’s how it operates today. Ideally, the feds are allowed to do only a handful of things. They get out of the way for the rest of the stuff and let the communities in the several states do their things. That’s how I interpret the Constitution. Local control is key and the Constitution influenced me in that regard. 71R: Libertarians tend to believe less government is better government. What is one area of government, however, you would like to see operating? Tucker: I believe that the purpose of government is to protect the rights of the people. That would include courts, peace officers, and a defensive military. On a municipal level, I think there’s a little more flexibility in what the government can do if its available to all people. Chicago has gorgeous parks, stocked libraries, and an extensive mass transit system, all of which I use. Ideally, all these things should be paid for by the most voluntarily or least coercively means possible. In the case of the parks, the libraries and the transit system, these could be fully or partially privatized. 71R: Branching off of the last question, what is one area you think there should be cutbacks or even elimination in the state of Illinois? Tucker: It’s hard to pick just one, but in Illinois, it would be taxes. We should cut or eliminate as many taxes as we can. Property taxes, incomes taxes, sales taxes, taxes on vices, taxes on bags. Let’s take a chainsaw to as many taxes as we can. 71R: What can the people of District Four expect should you be elected? Tucker: If enough of the people of District Four write me in, they can expect me to work many things that would help to reduce the size and scope of government. My major initiatives include establishing 401(k) plans for all new state government employees, slashing spending, cutting taxes and or abolishing as many taxes and regulations as possible, legalizing cannabis and psychedelic mushrooms and reforming the criminal justice system. I would also make the case for Cook County statehood any chance I could. 71R: If someone was interested in getting involved or donating, how can they reach out to your campaign? Tucker: Folks can reach out to me through my Facebook page (www.facebook.com/JustinTuckerforIL) if they want to get involved. Since I don’t want to deal with government authorities, I am not accepting donations; however, I highly recommend donating to Kash Jackson’s campaign for Illinois governor (www.kash2018.com/donate) or to the Libertarian Party of Illinois (www.lpillinois.org/donate). 71R: Do you have any final remarks for the readers? Tucker: The Libertarian Party is not possible without our candidates, our volunteers and our donors. Please consider volunteering a few hours a week to a Libertarian candidate. Be an activist in your local chapter, or if there aren’t any available, get a few friends together and form a LP chapter yourselves. If you want to share the LP with your neighbors, consider running for office or becoming a precinct committeeman. If you can’t donate your time, please donate your money. Every volunteer hour and every dollar helps us fuel the fires of liberty. Thank you! I would like to thank Justin Tucker for his time. Be sure to visit his website for more information. Following the retirement of SCOTUS Justice Anthony Kennedy, the Republicans and the Democrats are locked in a battle of wills over who will be the nominee to fill Kennedy’s seat. The current partisan makeup of the Senate is 51-49, with the Republicans having the narrow majority. Mitch McConnell and head Republicans went “nuclear” in 2017, changing the votes required for nomination of a Justice from 60 to a simple majority, in order to get Neil Gorsuch on the Supreme Court. These new rules allows for hyper partisan justices who are favored by the majority party in the Senate to be nominated. The Republican Party may be waiting to nominate a Justice until the midterm elections this November in order to use the nomination process as a political weapon to get people out and vote Republican. The Republicans used a similar tactic in 2016, blocking President Obama’s nomination, Merrick Garland, for 293 days until President Trump could nominate Neil Gorsuch. 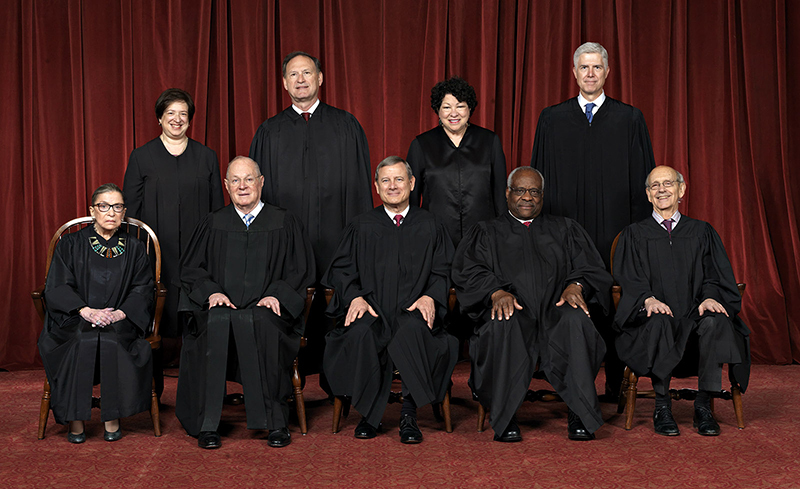 Voting Libertarian could save the Supreme Court from extreme partisanship. Should just two Libertarians be elected to the Senate, a 49-49-2 composition of parties would be created in the Senate, preventing any nomination that would be decided based on ideological differences and party politics. It would also allow for a return to nominating a Justice who would base their rulings on the constitution, rather than partisanship, just as Justice Anthony Kennedy had done. Justice Kennedy was a swing voter on the court, meaning he didn’t use his ideology as a basis for his rulings, but rather the Constitution. This upcoming election could be critical in determining if the United States will have a partisan court or a non-partisan court that chooses to prioritize the Constitution rather than political opinion in its rulings. Two options can save the court: voting for Libertarians, such as Matt Waters (L-VA), or by “denuclearizing” the Senate and justices are confirmed. “Denuclearization” would mean a return to requiring sixty votes to confirm a Supreme Court Justice – a change that won’t come voting Republican or Democrat. Only the introduction of a third party to the Senate can prevent a partisan Supreme Court and begin the process of “denuclearizing” the Supreme Court Justice nomination process.